If that's the case, I recommend you order from Valmour.The price is cheaper.Have you contacted the eBay shop?They may have some in their physical shop that they are willing to ship to customers. dropped by Ed Et Al today, couldn't resist getting another pair of brown shoes at $250! slowly building up a decent collection. Edwin will release the same model with a rounder and slimmer last in march, but I just couldn't wait. Very nice ! Do their shoes run 1 size smaller or do you use your regular shoe size when you bought this pair? geno, we would be very interested in your review of the shoes, and how they hold up over multiple wears. IMO the shoes look great, although personally I would prefer a slimmer and chiselled toe. shane: the sizes run narrow, I'm a 41-41.5 and i sized up to a 42. Ahh, thanks geno !. By any chance you stopping by KL ? hehe...I can tapau a pair of their lovely penny loafers. 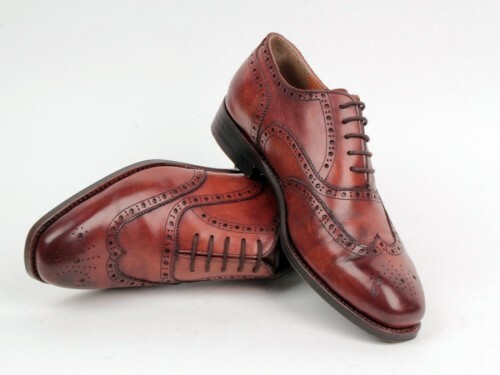 Oh yes, on a separate note, anyone have experience with burgundy oxfords? Trying to achieve that shine, but not the excess mirror type. So far I only have cody aqua stop and its bordeaux. What should I get ? Saphir? You can use StarWax Mahogany. Use a real horsehair brush to buff off. Jusco, Carrefour, everywhere actually. RM5.00. Every bit Saphir's quality. Not sure if you can find mahogany anymore, it seems to have vanished. Just brown and black. I have to check out a few around Subang and see if there are any around. I've seen some shoe care in Tangs Empire but not sure if they have star wax. You will find Starwax in Jusco One Utama, including Mahogany. Been lurking in this forum & Lowyat for quite a while, trying to gain a better knowledge on dress shoes. I think i've learnt quite a fair bit, but one particular information has evaded me for the longest of time. Hope you guys are able to help me out. 1) Do you guys personally see any differences in full grain shoes vs corrected grain shoes? 2) Do corrected grain shoes have shorter lifespans? 3) I've read on one of the forums that corrected grain shoes are harder to polish. Any truth to this? Yes there is certainlt a difference between full and corrected grain. Corrected grain looks smoother, more perfect, more consistent throughout. This defeats the purpose of wearing a beautifully tanned and dyed animal hide on your feet. I don't know if corrected grain shoes have shorter lifespans or if they are harder to polish -- in fact, they may take abuse better. Suede Loakes, got them about 2 weeks ago. A crepe brush is not optional with suede. Always brush in one direction only, not back and forth. Woly sells suede impregnators to recolour faded suede and give it some stain resistance. I apply this whenever I wash my suede shoes, which seems to be once a year. How do you wash your suede? Hey guys, anyone know if the J.M. Weston shop in Avenue K is still open? Out of curiosity's sake, I'm thinking of checking out their range of shoe care products when I drop by Avenue K tomorrow. Vaguely remember reading on SF that their products are rebranded Saphir. Could be an alternative local source of polishes/creams, depending on their prices (and mark-ups, as the Malaysian branch is actually a franchise I think). Will keep you guys posted. Bkt, where did you get those shoe trees?are those cedar? I put plastic shoe trees in them then wet them under a running tap then apply bar soap with the bristle end of the suede crepe brush. Scrub the shoe all over. Rinse under the tap. Soak up excess moisture with a rag. Let dry 2 weeks then apply the impregnator. J.M. Weston has long since closed at Avenue K.
i get much better results polishing full grain leather. Yes they are Cedar, was pass down to me.